This Direhorn is the Racial Mount for the Zandalari Troll Allied Race coming with the Battle for Azeroth expansion. This is a ground mount. The armoring on this mount matches the golden armoring on the Zandalari Troll characters' Jewelry and the style and coloration of their unlockable Heritage armor. 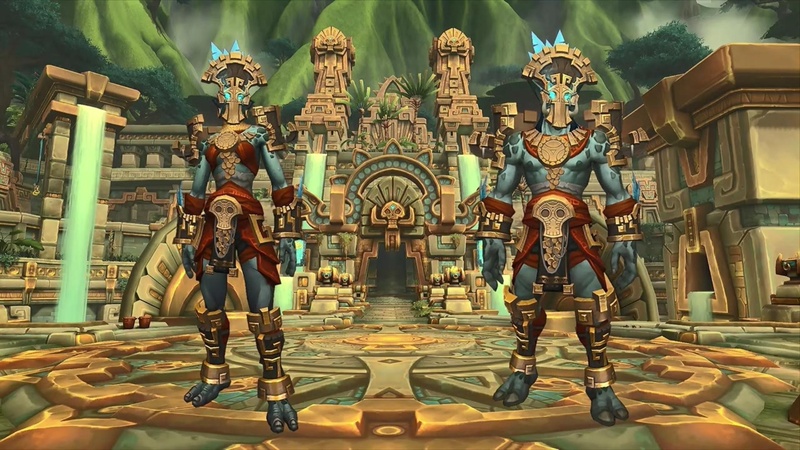 You can unlock the Zandalari Troll race after purchase of the Battle for Azeroth expansion and the fulfillment of some as yet unknown pre-requisites, likely achievement and reputation requirements, of some sort. The questline will likely begin in the Embassy section of Orgrimmar, as with the recruitment of other Horde Allied Races. can be used on any character of the same faction. At adolescence, those Zandalari males not chosen to be priests or scholars must prove their strength to the council, the king, and the gods themselves. A common rite is to travel to one of the violent, beast-ruled islands near the capital to steal or subdue a wild creature. The lesser troll races have their own, humbler versions of this tradition. But the mastery of ravasaurs or raptors is nothing compared to the power required to call upon a devilsaur or direhorn. After unlocking it I'm very disappointed in the texturing job. Compared to older Direhorn mounts, this one has blurry and low-res textures. It's as if they didn't scale the texture to the size of the model right, so it got all stretched and blurry. For comparison, look at the Crimson Primordial Direhorn; the scales and eyes are much more crisp and defined. "The Zandalari pride themselves on being the first to raise and train all of the most ferocious lizards on Azeroth."